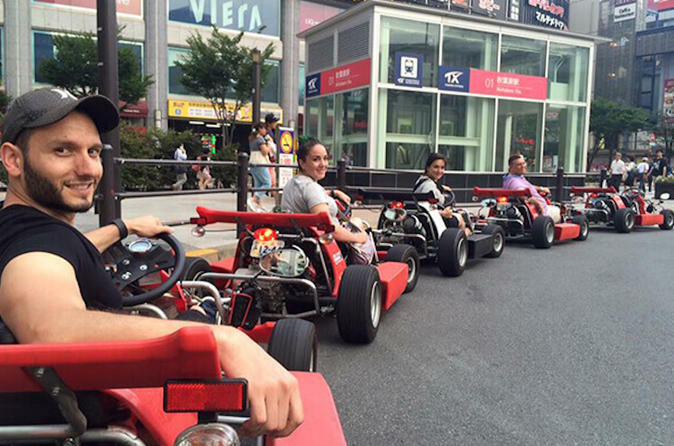 Explore Tokyo from behind the wheel of your own personal go-kart. Dress up in costume, if you choose. Feel as though you're in a game: navigate the streets with you guide with ease, for wherever your whim takes you, and see all the city's famous areas. An exciting way to see the city of Tokyo; choose from 1 - 5 hour options when you book. Customize your desired departure time between 10am and 7pm. One of the most unique activities in Tokyo! Get dressed up in costumes and explore downtown. It is not necessary to wear a helmet or protection, so you will feel the exhilarating wind as you navigate the streets. Your local guide will lead you, so there is no need to worry. This guided go-kart rental is highly recommended for the fist time visitor and driver in Japan. Drive your go-kart on the public road from Akihabara, the place well-known as an Otaku city, to your requested places, such as Imperial Palace and Ginza district. This is a rare opportunity to see the town from the street with wheel in your hand! The facility has costumes that you can borrow for no charge; however, you can buy some inexpensive costumes at the nearby Don Quixote shop if you would like your own. All karts are for one person. There are no multi-person karts. The guide will drive in a separate kart. Please note: it is not recommend you park the kart anywhere because there are not many parking lots in Tokyo, and the supplier does not take any responsibility if any accidents happen to the kart.